Fourteen different players from the Green Bay Packers scored touchdowns in the team’s five Super Bowl appearances. 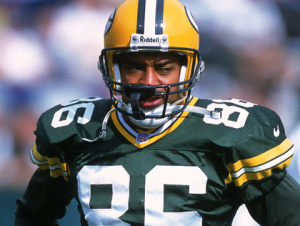 Leading the way is receiver Antonio Freeman who had three TDs in two Super Bowl games. Three other Packers had multiple Super Bowl TDs: Greg Jennings, Max McGee and Elijah Pitts. Freeman, Jennings, McGee and Pitts each had several regular season TD with the Packers: Freeman had 57, Jennings ad 53, McGee had 51, and Pitts had 35. In addition to the players above, there are several Green Bay players who scored 30 or more regular season TDs for the team yet did not get a Super Bowl score. Topping the list is Ahman Green; he had 68 career touchdowns with the Packers yet did not have a Super Bowl score. Following are the 13 Packers players who scored 30 or more career TDs with the team but did not have a Super Bowl TD (since 1966).